In honor of Roslindale hero Steve Gag, Roslindale Village Main Streets supporters raised several thousands dollars to kick off a campaign to install a bike corral in Rozzie Square. 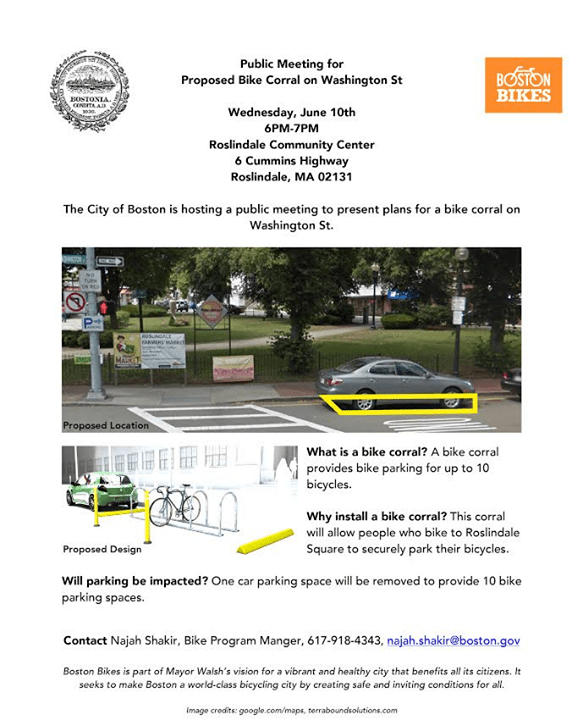 The proposal is to replace one car parking space with ten bike spaces (note the ratio!). This investment in infrastructure is important both for the direct utility it brings and for the message it sends–better bike and ped infrastructure changes mindsets, bringing people out on foot and bike, resulting in a virtuous self-reinforcing circle. The City of Boston is hosting a public meeting on June 10, 6pm-7pm, at the Roslindale Community Center, to present the city’s plan. If you share the WalkUP vision, come to learn more about the project and support this step in the right direction.